By all accounts, Sound City was a dump. It wasn't a place that would draw artists, but the owners invested in a state of the art (for the time) Neve soundboard early on. This was no small undertaking, as it was hand built by British electronics genius Rupert Neve himself and cost over $75,000. Between the unique equipment, a chance meeting that led to the powerhouse lineup that rocketed Fleetwood Mac to super-stardom, and their friendly staff, Sound City became a go-to recording studio (a veritable who's who of musicians recorded there - watch the doc and be amazed). As the music industry started to move from the analog format to digital formats (beginning in the mid-80's) Sound City found itself on the outside looking in. Many artists were able to begin recording and mixing on their own thanks to new programming for computers. The studio caught a second wind when a young trio from Seattle calling themselves Nirvana recorded what would become what many consider the most significant rock album of the '90's. This drove a wave of new blood to the dumpy Van Nuys studio, but eventually the industry's move to digital formats spelled doom for Sound City. Grohl says in the film that he started out wanting to make a documentary about the Neve board, and then it snowballed and evolved into something else: a much deeper look at the recording studio and the experiences that many, many musicians had there over the years. When Sound City finally closed it's doors for good, Grohl feared that the Neve sound board would end up collecting dust in storage or in a museum somewhere no longer being used (there were only four made and this is the only known functioning one). He bought the board and moved it to his own studio near Los Angeles (Studio 606). Then as part of the documentary, he invited some of the biggest names who had recorded at Sound City to record new songs in the new studio with the old board that had at one time or another brought them all to the same place. The story of the rise and fall of Sound City is interesting enough, but when you add to that the personal experiences and stories of the artists who recorded there and how Sound City impacted their lives, you get a truly engrossing documentary. I am slightly biased as I've been a fan of Grohl's since his days in Nirvana, but this should be required viewing for any music fan. The appreciation and respect for the craft and the musicians that came before shown by Grohl and others is inspiring. 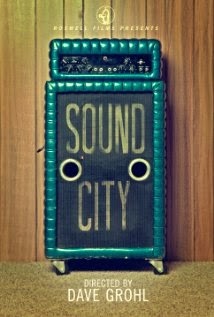 You can stream Sound City via Amazon Prime here. - I won't get everyone, but a number of the artists that are interviewed or appear in this film are (in no particular order): Mick Fleetwood, Stevie Nicks, Lindsey Buckingham, Tom Petty, John Fogerty, Barry Manilow, Neil Young, Trent Reznor, Josh Homme, Rivers Cuomo, Rick Springfield, Rick Rubin, Lars Ulrich, Corey Taylor, Butch Vig, Krist Novoselic, Taylor Hawkins, Pat Smear, Grohl and Sir Paul McCartney.